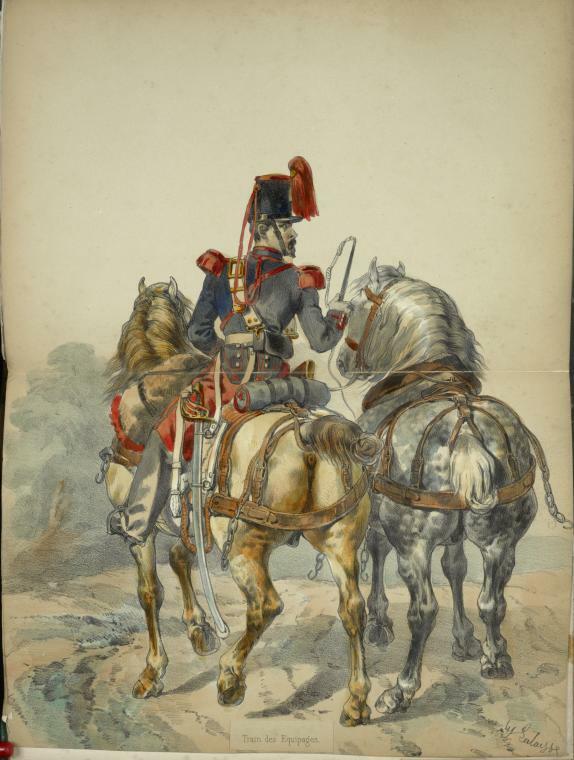 During the Crimean War the French army used two main types of Field Artillery - Artillerie Montee (mounted artillery) where the gunners rode on the limbers and caissons (but NCOs and Officers were mounted) and Artillerie a Cheval (Horse Artillery) where the gunners and officers were mounted on horses. They were armed with the revolutionary 12-cm calibre shell-gun or Canon-Obusier (literally, Gun-Howitzer) designed by Louis-Napoleon which could fire explosive shells, solid round shot and case shot (Mitraille). In 1848, Napoleon III inherited an artillery which was chaotically organised, a problem which stemmed back nearly twenty years. 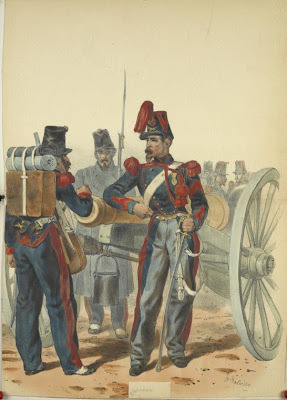 The Artillery had been re-organised in 1829 when the Train d'Artillerie was massively reduced in size and the majority personnel incorporated directly with each battery they were serving. They were trained primarily to drive, but had sufficient artillery training to fill any gap in a gun crew that might arise, and were termed Canoniers-Conducteurs The remainder of the Train d'Artillerie was incorporated with the Park, to move the siege guns, position guns and the pontoon train. In 1833 the artillery was re-organised to reflect the fact that the discinction between foot and horse artillery had become blurred following the adoption of the Valee System where gunners were able to ride on the limbers and caissons of the artillery drastically increasing the mobility and speed of the artillery. The separate Horse and Foot artillery regiments were disbanded and instead each regiment would include companies of foot, horse and vehicle-mounted. The new organisation was as confused as it was confusing. Regiments were composed from three batteries of horse artillery, six batteries of vehicle-mounted (artillerie montee) artillery and seven batteries of foot artillery. The Canoniers-Conducteurs were only attached to the horse and mounted branches, which meant the Foot Artillery had to call on the Train d'Artillerie to move their guns. Furthermore, Foot Artillery batteries were only issued guns when on service! 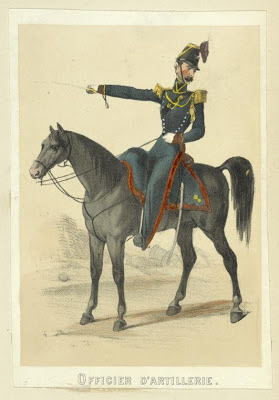 The horse and mounted artillery were for service in the field and the foot artillery to man fortress and siege guns. This organisation meant that a regiment was often broken up by companies when on service. Furthermore, in many situations, these foot artillery batteries were called upon to act in the field, which required them being issued with a horse team and drivers, or vice versa when mounted artillery was required to act as position or fortress batteries in Algeria in 1838. 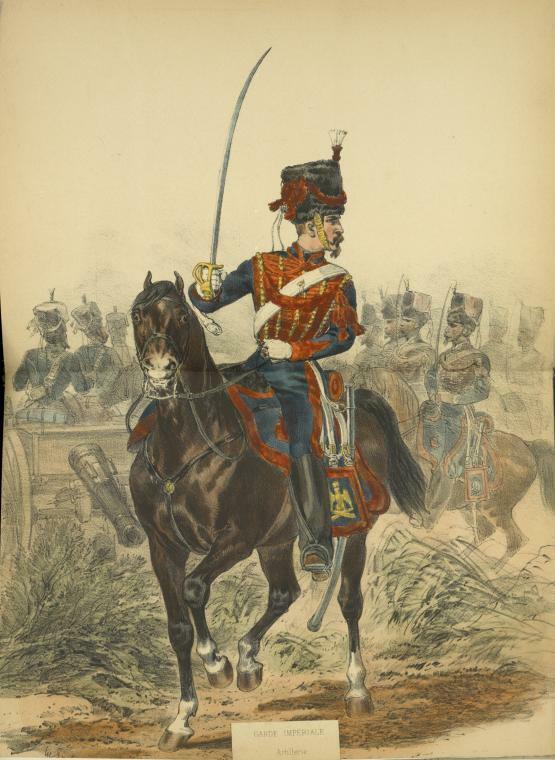 The logical conclusion to this was to form, once again, regiments of specifically horse, mounted or foot artillery. 1ere to 5eme Regiment d'Artillerie: Foot Artillery Regiments, each regiment comprising 12 siege batteries and 6 batteries of park artillery and materiel. 6eme Regiment d'Artillerie: Pontoon Regiment, consisting of 12 companies of pontooneers and 4 companies of drivers. 7eme to 13eme Regiment d'Artillerie: Mounted Artillery, each regiment consisting of 15 batteries. Gunners mounted on vehicles; officers, gun captains and trumpeters mounted on horses. 14eme to 17eme Regiment d'Artillerie: Horse Artillery, each regiment consisting of 8 batteries. In addition there were 12 companies of artillery workmen, 5 companies of armourers and five companies of veteran artillery. On the 17th January 1853 the old 1837 12-pounder and 15cm Howitzer gun tubes were abolished, and replaced by the new Canon-Obusier de 12 (12-cm cannon-howitzer), nicknamed the “Napoleon” after it's progenitor, Napoleon III, and it was able to fire both solid shot, spherical shell and cannister shot. The Napoleon is often erroneously referred to as a 12-pdr from its name, when it fact it refers to its calibre (121mm) rather than its weight of shot. At the same time, the 8-pdr was withdrawn from service, re-bored to 12-cm calibre to create the canon de 12 legere (light 12-cm field gun) which was then issued to the horse artillery until sufficient canon-obusiers could be produced. This meant that in the Crimea the French had but one calibre of field gun – the 12-pdr – and one field carriage, that of the 8-pdr. The single calibre of field gun also meant that ammunition control and supply was rendered considerably more simple. The obus-spherique dit Shrapnel was the same round whether it was for the Napoleon, piece 12-legere or the 12cm mountain howitzer. Reserve Artillery continued to be issued with the old 1827 12-pdr and 16cm howitzer. The 15cm howitzer was abolished completely. Each battery had six pieces: for the Divisional Artillery these were six long guns (either Napoleons or light 12-pdrs) but for the Reserve Artillery four 12-pdrs and two 16cm Howitzers. In addition was the Batterie do Montagne armed with six 12-cm Obusiers de Montagne (Mountain Howitzers) which utilised the same ammunition as the 12-cm Canon-Obusier and the Batteries des Fusees (Rocket Batteries). Each artillery regiment had "Cadre" which was the minium or skeleton establishment in peace time which was rapidly inflated to a "War Footing". In addition, each Batterie was to provde the basis for an additional or suplementary battery ( a Battery "Bis"). The following tables lists the entire batteries sent out by each regiment whilst detachments and the batteries from which they came are shown in parenthesis. Régiment d'Artillerie à Pied de la Garde. Batteries : 1 ; 2 ; 7 bis ; 8 bis. Régiment d'Artillerie à Cheval de la Garde. Batteries : 1 ; 2 ; 3 ; 4. 5ème Compagnie d'ouvriers d'artillerie . 1st Infantry Division: 1e Batterie, 17e Regiment; 4e Batterie, 16e Regiment; Batterie des Fuseens; Batterie de Montagme. 2nd Infantry Division: 1e and 13eBis Batteries. 1e Regiment; 12e and 13eBis Bateries, 4e Regiment. In addition were the companies of Ouvriers d'Artillerie which were part of the Etat Major Particuliere.